Just kidding. We didn’t know anyone else at the castle. But there were thousands of other people in Schwangau the day we arrived despite the chilly temps and drizzly weather. 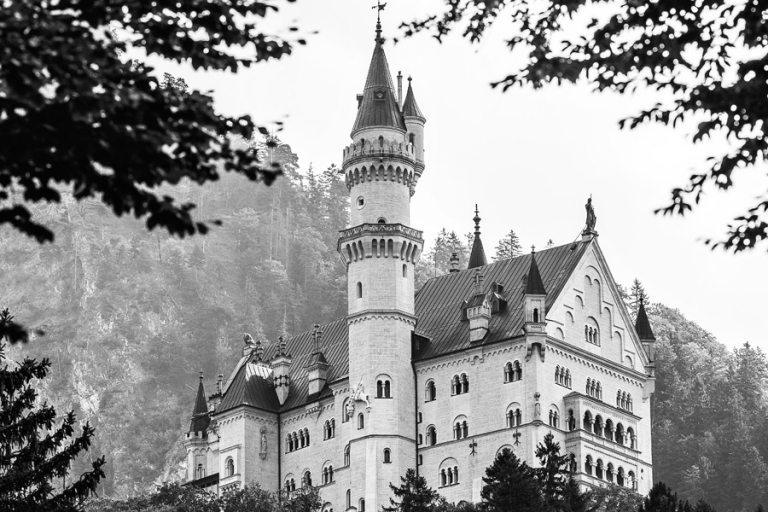 I had dreamy visions of visiting the famous Neuschwanstein castle on a day with perfect lighting, blue skies and puffy white clouds, and with Queen Mary’s Bridge all to myself for optimal photography opportunities. Just kidding again. I knew we would share the bridge with huge crowds, and I only hoped we’d have weather clear enough to enjoy the walk up and down the path to the castle. The rain held off, but we did end up with a white sky and some foggy conditions. 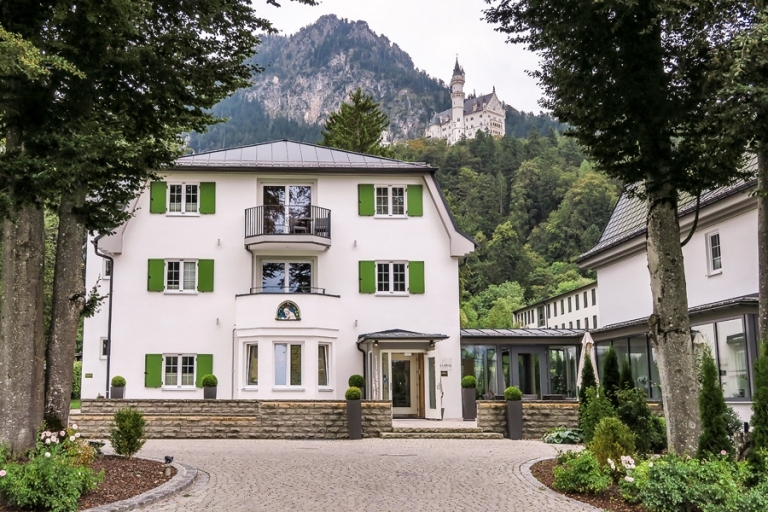 I know a lot of people visit the Fussen/Schwangau area as a day trip from Munich, but in my hopes of giving myself the best chance to get good photos of the castle, I booked one night at the Villa Ludwig Suite Hotel right beneath Neuschwanstein. The hotel turned out to be a super convenient location to the castle especially since we arrived by car and they have underground parking. On top of that, we loved our big-enough-for-dozens-of-people-sized room and the Sleepy Sheep gummies on our pillow at night. My one small regret of the day: I didn’t buy tickets to the castle ahead of time. We weren’t quite sure what day we would definitely go up to the castle depending on the weather, so I purposely didn’t buy advance admission online. 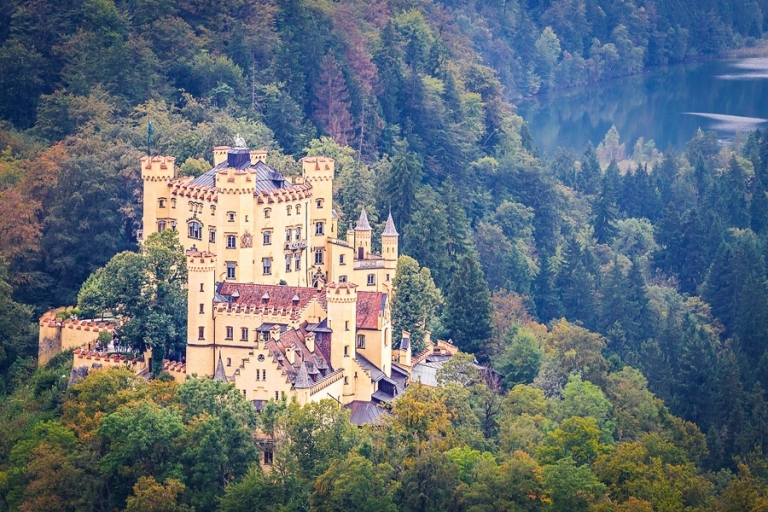 The weather forecast indicated rain on both days straddling our one-night stay (and for three days after that), so we decided to go ahead and get our castle touring on right away. Unfortunately the abysmally long line at the ticket office snaked around the entire queue railings and out along the sidewalk. We stubbornly stood in line for about twenty minutes, and after not moving more than a few feet, we decided we didn’t absolutely have to see the inside of Neuschwanstein after all. 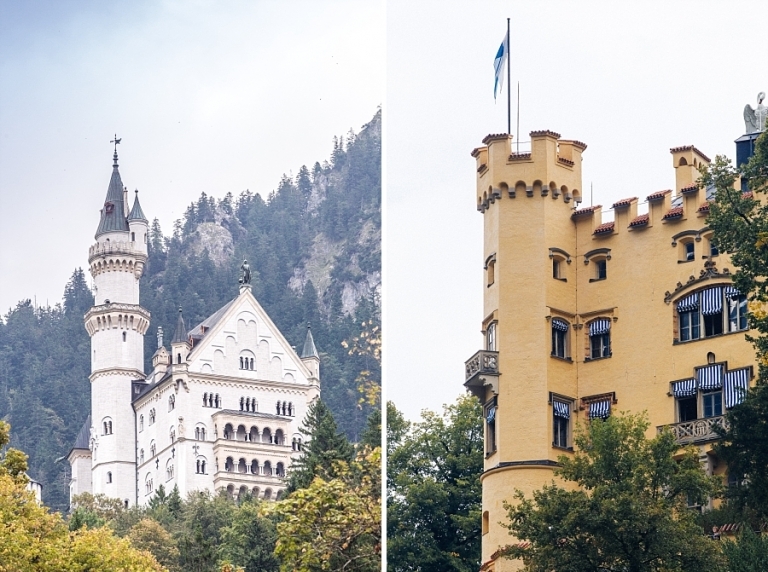 We made the trek up the hill sans tickets to see Neuschwanstein, and enjoyed scenic views of Hohenschwangau and Lake Alpsee on the way, too. We may have had dull skies, but I was happy to see that neither castle was covered in scaffolding. Bonus! The path up to the castle didn’t seem particularly crowded, but as soon as we completed the last few steps of our climb we found all the people. 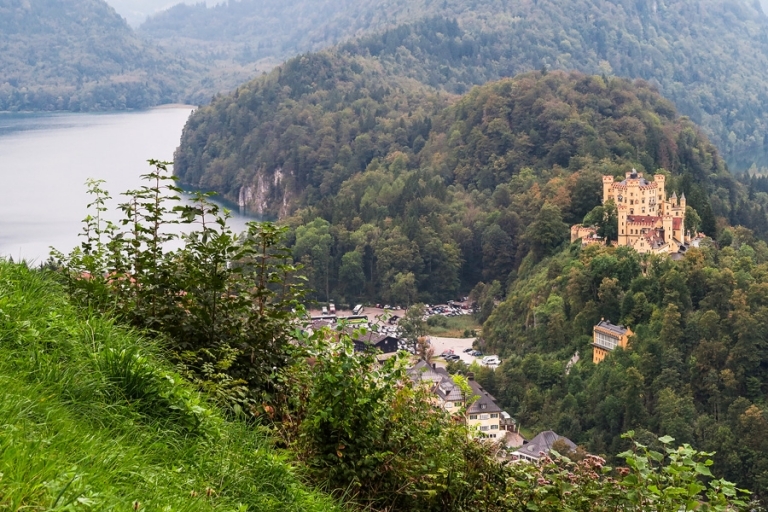 Standing on every inch of the bridge, people selfied and photographed and admired the famous view of Neuschwanstein. Only weeks before, the bridge had been closed for renovations and I wondered if it would indeed be up to the task of holding us all at once! I have to confess that this was one of those travel moments that I expected to be grander and more impactful, but it simply wasn’t the case for me, and that’s okay. Yes, the castle was extraordinarily pretty, I enjoyed taking my own photo of the iconic landmark, and I’m glad to check this one off the must-see list, but I pretty much just snapped the photo below and that was that. Maybe seeing the inside would have formed a better connection to the castle for me, but I’m going to chalk it up to the crowds, the dreary sky, and the fact that super long lines make me a little cranky. We popped over to Fussen for dinner that evening, but the cloudiest skies turned into a torrential downpour, so we only made a beeline to and from the restaurant and didn’t explore the town at all (thus I have zero photos of Fussen). As night fell, we relaxed in our hotel room listening to the rain and watching the fog drift around the castle, marveling at the majesty of it. It really is quite stunning. Up next, the main event that sparked this entire European itinerary: Oktoberfest in Munich!